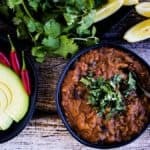 This vegetarian Instant Pot chili is spicy and delicious, and so healthy, too. I topped mine with cheese and sour cream, but on its own it is vegan. This recipe makes a large amount, but fortunately it keeps well. I’m planning to freeze several portions so that I can enjoy it down the road some day when I don’t even have time to whip up an Instant Pot dinner. Reprinted with permission from The Gluten-Free Instant Pot Cookbook. Place the tomatoes, peppers, onion, garlic, walnuts, lentils, and seasonings in the inner pot of your electric pressure cooker. Stir in 6 cups (1410 ml) of the vegetable stock. Since I am allergic to walnuts, I asked the authors what I should substitute. They said that the walnuts are meant to mimic the texture of ground meat and that they could be left out, which is what I did. I think the chili would be even better with the nuts as some contrasting texture would have been welcome. I would think you could easily substitute other nuts (almonds or pecans, perhaps) or pumpkin or sunflower seeds. Since my family is not vegetarian, the next time I make it, I might just add some browned ground turkey. The book says that the recipe serves 6, but even made without the walnuts (and with no substitute), I found it made a large amount, easily enough to make several meals for my family of three. It keeps well and makes great leftovers, so this is a bonus for me, but just something to keep in mind if you are cooking for a small family and don’t want a lot of leftovers. The recipe is easily halved.